The purpose of any medical facility is to serve patients’ needs. To do this, it is necessary for the facility’s design to support the functions and operations of the organization it houses. 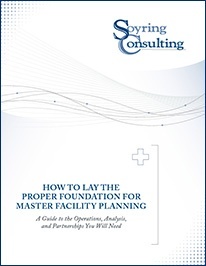 Creating a Master Facility Plan (MFP) can be a daunting process, so it may be tempting to simplify it as much as possible by simply designing a building. However, it is important not to miss the opportunity to take advantage of making operational improvements through facility planning. Soyring Consulting provides managerial and operational consulting services to healthcare facilities of all sizes, including For-profit, Not-for-profit, Community, University, and Faith-based facilities and systems. Two of our key areas of focus are Master Planning and Strategic Planning.